My concern is that since there's really no transmission to isolate the back wheel that I'll do damage to the motor or controller by towing it for long distances. For only $134, this seems like an elegant solution, but is it safe for an electric scooter? Re: Any issues using a towing cradle? Tow it with the rear wheel in the cradle, or you can get one of these. I was thinking of running a throttle pot from the bike up to the cab of my Mazda Pick-Up and when the bike is strapped in, I have a hybrid. It could allow for electrified transportation in bad weather. I found the same unit as moccasin did, a few weeks ago. I personnally would not tow with the hub motor/planet type transmission assembly without written approval from Vetrix. Vetrix should experiment and develop towing specifications and add them to the marketing scheme. I am sure many vetrix owners would like to take them on vacation in tow behind a compact car. 5 years ago I met Jesus and he total ruined my life. I have never been happier. How would you get the front wheel up into the cradle? These things to cradle the front wheel look interesting. They're of course assuming that the motorcycle has a transmission and can be put into neutral. Motorcycle wheels obviously can handle the speed so the weak part would be whether the motor can take being externally rotated. On a bike with a chain drive I'd think one could disconnect the chain? I used to work as a tow truck operator. One gizmo they have we called a 'dolly' ... the version I was familiar with worked for a four-wheeler but I can imagine a version for a two-wheeler. On a two-wheeler it would be four wheels that can roll freely, close enough together to form a trough the right size for a motorcycle wheel. You back the motorcycle onto the dolly and strap it in, then put the front wheel on the gizmos you linked above. Trailer in a Bag looks to be very compact ... http://www.7gen.com/website/motorcycle-towing/trailer-bag/1711 Likewise the Stinger trailer ... http://www.7gen.com/website/motorcycle-towing/stinger-trailer/1710 ... Both are pretty expensive though. Lesser expensive haulers come with a small detachable ramp. More complex (read that expensive) systems have a crank lift. Here's a you tube video of the "Undertaker" system of similar design with crank lift. The Handi-Hauler just uses a 2x6 plank as a ramp. Towing a bike with a chain drive has some potentially damaging effects. Normally, the chain is either under positive or negative drag as the bike is accellerated and decellerated, and only coasts for short distances. Towing a chain drive bike is "coasting" it at high speeds for long distances, and without some kind of resistance, the chain will "bounce" within it's slack tolerances. Long stretches of high speed bouncing and flouncing of the chain will cause rapid wear of the chain and the sprockets, and if by some odd chance, the chain breaks under tow, it can do a lot of damage to the bike on it's way out. A broken chain can lock a rear wheel if it doesn't run out smoothly, and although this could be scary to a rider, it would be disastrous to a bike in tow! I also want to report back on the "Undertaker" tow system that I mentioned earlier. These units are too large to adequately support the smaller diameter front wheel of the Vectrix, and many other scooters. That's not to say they won't work, but they will need additional tire supports to be bolted or welded on to handle the smaller scooter wheels. I bought a similar unit off eBay, and although it seems quite well made, I'll have to do some work on it before using it for the Vectrix. What happens to the currents induced by the rotating permanent magnets? Could they possibly overheat or otherwise damage the electronics or the battery? that would depend on how the power stage is setup on the vectrix controller. If its conventional, nothing would happen. The rotating permanent magnets would create a voltage across the motor, however if the gates in the controller are all off (as will be the case for an "off" scooter), the resistance will be too high for any meaningful current to flow. the only thing you ever have to worry about in towing an ev is overspeeding the motor resulting in mechanical failure. since the vectrix is single ratio, and already designed to do highway speeds, i doubt this will be a problem. If the throttle is at rest, or the switch is off, there ain't no current flowing, and without flowing current, there ain't no heat, other than bearing heat, which is normal anyway. I bought one of the http://www.prohoists.com/Shopping.idc?ProductID=35 cradles and build a ramp for it to load the Vectrix. The front wheel fits well and the supports for strapping her in are excellent. Certainly a sturdy unit for short distance recovery. I decided to get a trailer in a bag instead and will give this new unit to anyone willing to pay $50 to cover UPS shippment. Just drop me an email. It will ship in original box. Ok, now I'm reporting back, as I finished the modifications to my tow system today. 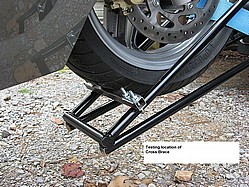 For this open cage type system, you need to reduce the tire space by 3.5" to accomodate the 13" wheel of the Vectrix. This can be done fairly easily with the addition of a cross brace. Click here to see more of what was done to achieve this. Unfortunately, it's illegal to tow a bike like that in my country. Can you make an estimate how much downward pressure the Vectrix and the Undertaker put onto the towball? I'm just wondering how big the towing car needs to be. Can you roll the Vectrix up the little ramp when it is off or not working? 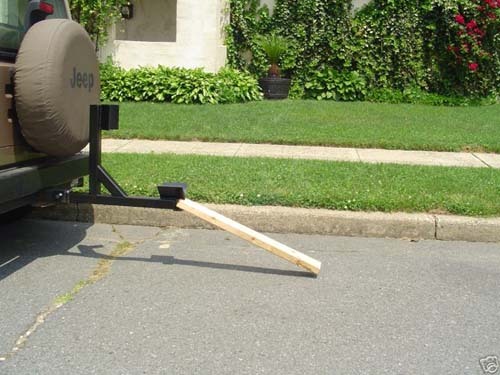 Any vehicle that can be outfitted with a class III hitch can handle the weight of the Vectrix. I would NOT recommend the use of any bumper mounted hitch system. I would imagine that since half the weight of the bike is supported by its own rear wheel, there's likely never more than 300 lbs of tongue weight, but I have no way of knowing that. My truck squatted about the same with the bike as it does when I step up onto the bumper. In the one shot that I show the bike sitting in the cage but not yet tied to the bumper, I manually rolled the bike up the ramp while it was turned off. You need a few inches of free space to get the bike moving, then it rolls right up. The only issue I had to deal with is that the wheel is not initially at rest in the cage, so you must keep one of the brake levers pulled until you get the bike on it's sidestand, or it will roll back out. If the bike has power, it won't even need the ramp. If there's enough traction under the rear tire, it will climb up into the cage. Loading on a grassy shoulder, or on soft soil, it would need the ramp. Did anybody think through putting the bike in backwards .. propping the rear wheel in the cradle and the front wheel on the ground? 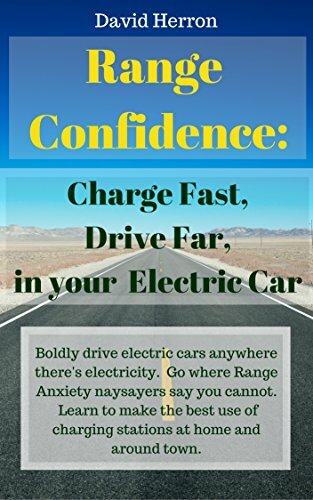 My guesstimation is - since we're concerned about damage to the electric motor, that the only freewheeling wheel on an electric motorcycle is the front. 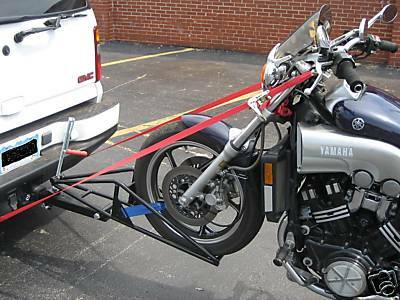 Obviously it requires more straps to hold the front wheel in place as well as strap the bike to the tow vehicle. I'm imagining there may be clearance issues depending on the bike styling .. e.g. there could be rear fairing or saddlebags or whatnot whose geometry interferes with sitting in the cradle. Hope everything goes well with your towing cradle and no damage to your vectrix. I have a EMB and I have similar concerns with transporting. Sure I can toss it in the cargo area, but I lose the back seats. 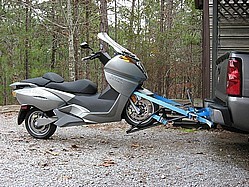 So I was looking into the a towing cradle that the bike is fully supported by the hitch much the same way that mobility scooters are transported. 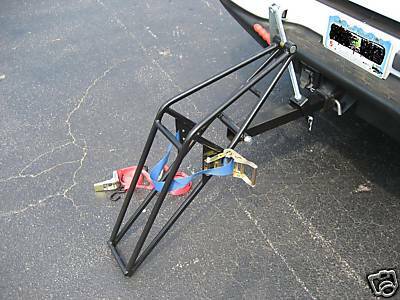 From these, I have only seen one homebuilt example of it on ebay that looked sturdy enough that used the hitch and side supports from chassis mounts. I have also seen Cycle world do a couple of reviews of other types like one of the earlier examples that someone posted but they reported that due to the hitch being the sole center support that the products wobbled too much. I think to get what I want, I have pretty much resigned myself on busting out my welder and making my own. I'm no geometry expert, but lifting and towing from the rear wheel just seems all wrong. The wheel that remains on the ground must be allowed to swivel (by the neck of the bike) or serious damage to the tire and possibly frame would occur when the towing vehicle makes a turn. Lifting the rear wheel stands the forks up straight, so effectively, the front wheel would then literally become a "swivel wheel", which might be fine, exept that it could be slapping the fork stops and beating the daylights out of the frame. the front wheel would then literally become a "swivel wheel", which might be fine, exept that it could be slapping the fork stops and beating the daylights out of the frame. Reread what I asked.. I suggested straps on the handlebar to hold the front straight. Yes of course it would be harmful if the front of the bike were swinging around, but with straps to hold it in place I expect the front of the bike would not be swinging around as you're suggesting. You can't do that. As a "following fith" wheel behind the four wheels of a car or truck, the fifth wheel must be allowed to tilt or turn. Otherwise when the towing vehicle turns, the fith wheel will get dragged sideways. Securing the handlebars would not only ruin the tire tread, but could cause way too much stress on the neck. Okay, thanks, when I tried to envision this that was one of the possible scenarios that came to mind. Then ... with the cradle pictured above the straps would be attached to the forks? And that the main body of the bike is allowed swing around as the tow vehicle turns? Yes, The body of the bike actually leans as the tow vehicle turns, and the leaning tire will track the vehicle. Here's a videoof a tow cradle in action. You'll notice that the bike leans away from the curve, rather than into it. This is normal. I also want to report back on the "Undertaker" tow system that I mentioned earlier. These units are too large to adequately support the smaller diameter front wheel of the Vectrix, and many other scooters. That's not to say they won't work, but they will need additional tire supports to be bolted or welded on to handle the smaller scooter wheels. Note that the Handi-Hauler guys will shrink their cradle to fit small front wheels at no charge. Just let them know when you make your order. Just to follow up on this, I finally purchased a Handi-Hauler and used it last week to deliver my bike to the local dealer for a firmware upgrade. Not surprisingly, I used it shortly thereafter for a quick rescue after fully depleting the charge following the battery management initialization procedure. (Unfortunately, I live half way up one of the mountains here in the Cascade foothills.) I'm happy to report that the unit worked as advertised, and it was sized to the VX-1 front wheel nicely. For the price, I'd consider it a must-have purchase for any Vectrix owner. Clearly, you don't want to buy cheap tie-downs for this. I'd hate to think what would happen if one of them released when cruising down the highway. Even at low speeds, tight corners cause the bike to tilt dramatically, and you're relying on the tie-downs to keep over 500 lbs from crashing to the pavement. Also, be very careful when in reverse. It has a tendency to jackknife more easily than your typical trailer because the towed axle is closer to the hitch. Just thought I would update this thread - I recently towed my VX-1 behind my Tesla Model X all the way from Denver, Colorado to Seal Beach, CA (1026 miles) using a very similar set up. along with 5 cargo straps. I attached two ratchet straps from the rings on the carrier to the vectrix handlebars, 2 from the tow chain hooks on the car to the loops on the forks, and one was tightened down around the wheel and the frame of the carrier. Stayed mostly around 65mph the whole way and stopped about every 150 miles to charge the model x and check the tie downs. No issues with the vectrix after and only slight warmth from the rear wheel hub each time we stopped. I wonder why all the EV manufacturers say you cannot tow their vehicles with all four wheels down? Did you tow your VX1 with the drive wheel down? I would love to tow my Tesla behind my motorhome. I already have a lift to get my Vectrix off the ground behind the RV, the Model 3 is way too heavy to try that with.